The Heinkel He 111 was the natural twin-engined outgrowth of the Heinkel 70 bomber used to such great effect in Spain. Although revealed to the world as a civil airliner, it was designed for bombing. 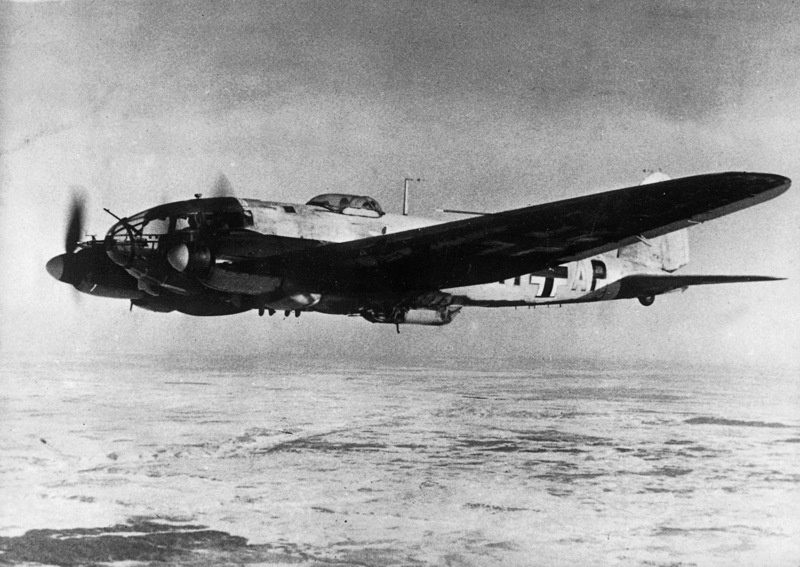 Powered by twin BMW VI engines, it could carry 1000kg (2205lb) of bombs stowed nose-up in eight cells in the centre section. In 1937 some similar machines flew secret reconnaissance missions over Britain, France and the Soviet Union in the guise of airliners, and in the same year the He 111B-1 entered service with the Luftwaffe. In February 1937 operations began with the Condor Legion in Spain, where its seeming invincibility led many to become complacent. The 300 He 111B-1s were followed by 190 He 111E bombers with Junkers Jumo 211 engines. The next significant model, in spring 1939, was the He 111P with the asymmetric fully glazed nose typical of all subsequent models. Some 400 aircraft were built in six sub-variants (He 111P-1 to He 111P-6). The definitive model was the He 111H (6150 built in 23 sub-variants). Development was characterized by a progressively uprated powerplant, increased fuel capacity, improved defensive and offensive armament, additional armour protection and provision for use in alternative roles: anti-shipping, path­finding, missile platform, paratroop-delivery and glider-towing.